The old adage that there is strength in numbers has never been more true. Just look at the recent override of the Governor’s veto of the Healthy Working Family Act (Mandatory Sick Leave) (HB1). The good news is that the Maryland legislature does listen to their constituents. The bad news is that many CPAs and businesses are ‘too busy’ to make time to get involved in politics.The result is that legislation that negatively impacts them gets passed as special interest groups make time to get heard and successfully pass legislation. Then we all complain about the onerous legislation that we have to comply with. It is time to change that and it starts with you! 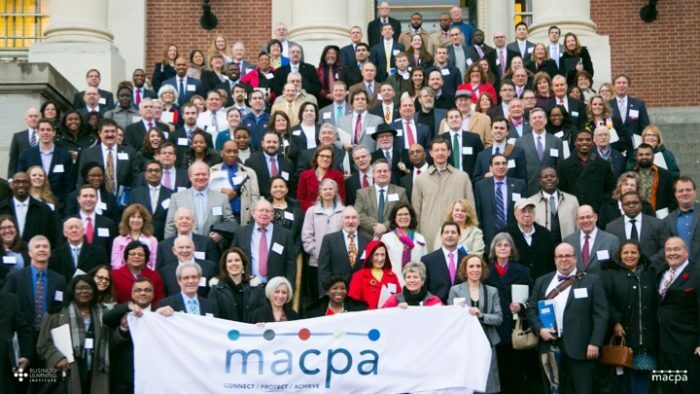 At MACPA, We choose to be participants in the legislative process and this will be our 118th year advocating for CPAs and businesses. Advising the Maryland legislature on the impacts of the Federal Tax Cuts and Jobs Act on Maryland taxpayers (see the Baltimore Sun article Maryland leaders will pitch dueling plans for state tax relief. Support an extension of time to comply with the Healthy Working Family Act (HB 1) which is set to go into effect on February 11, 2018 after the legislature overrode the Governor’s veto. Support a retroactive amendment to the Contraceptive Equity Act of 2016 which has the unintended consequence of making certain HSAs and HDHPs non-deductible as of January 1, 2018. See our Legislative Alert here. Maintaining fair tort liability by keeping Maryland’s Contributory Negligence Standard and protecting CPAs and business from frivolous lawsuits. Weighing in on numerous tax proposals, including the major compliance issues regarding sales taxes on services. Monitoring close to three thousand bills over the 90-day period of our General Assembly. Last year’s legislative recap here.